A while back, I participated in #Choctoberfest, which was a week-long multi-blogger event featuring chocolate recipes. Luckily for me, I had a guest post that week that featured chocolate because I really wasn't doing a whole lot of cooking then. I'm getting back to normal now. Or I guess it's the new normal, because things won't be the same as the were before. In any case, the kitchen is open again, and I've been doing some actual cooking. Real food. Not always blog-worthy, but nutritious. I'm sure I will still have bad days and it might take me a while to blogging with the same frequency as before, but I will be getting back. I have to, right? It's what I do. So anyway, as part of Choctoberfest, I got a shipment of goodies from a company called Just Hemp Foods, including hemp oil , toasted hemp seeds , hulled hemp seeds , and hemp protein powder . Because the items didn't arrive in time for me to use them for a chocolate-week post, I decided use the products in something completely different - bread. I used the hemp oil in the dough (it's really GREEN!) and I used hulled hemp seeds as a topping, the same way I often use sesame or poppy seeds. The hulled hemp seeds were pretty soft, which surprised me. The taste was mild and a little nutty. I really liked them. I think they'll be a lot of fun to use. 2 1/4 teaspoons active dry yeast. Combine the water, yeast, sugar, bread flour, salt, and hemp oil in the bowl of your stand mixer fitted with the dough hook. Mix on low until combined then increase the speed to medium and continue kneading until the dough is elastic. Cover the bowl with plastic wrap or another cover and set aside to rise until doubled in size, about an hour. Flour your work surface and spray a loaf pan (8x4 or 9x5) with baking spray. This isn't necessary, but it's good insurance that the bread will release from the pan. Turn out the dough and divide into 3 or 4 pieces, depending on how many strands you want to braid. 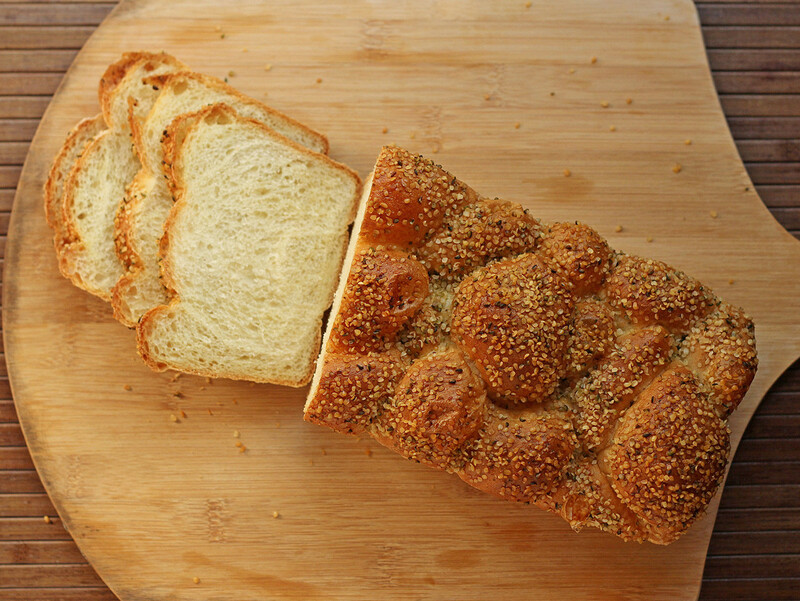 Form each piece into a rope about 1 1/2 times the length of your bread pan. You don't need to measure, just eyeball it. Lay the ropes side-by side and pinch one set of ends together, then braid the ropes and pinch the final end together. Fold the ends under to hide the pinched ends and place the braid in the prepared bread pan. Cover the bread pan with plastic wrap and set aside to rise until it reaches the top of the pan, about 40 minutes. Meanwhile, heat the oven to 350 degrees. When the bread has risen, remove the plastic wrap, brush the top of the bread with the egg wash, and sprinkle generously with the hemp seeds. Bake at 350 degrees until the loaf is nicely browned, about 35 minutes. Remove the loaf from the pan and allow to cool completely on a wire rack before slicing. Thanks to Just Hemp Foods for sponsoring this post and for sponsoring #Choctoberfest.